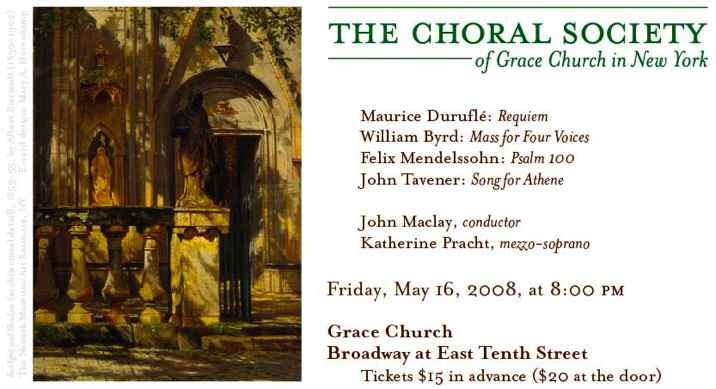 I love this picture of Grace Church that they’re using on this concert flyer! It’s a lovely program. The Song for Athene was sung at the funeral for Princess Diana. It’s singularly beautiful, haunting and ethereal piece. Do you know whether there will a recording of this performance ? I’ve finished your book about New York crime by the way. Really enjoyed it. Looking forward to the next one. Ohmygod, someone in the UK read my book! I can’t tell you how much fun that is to know. Thank you!! They usually record all our performances, but it sometimes takes forever for them to be made available. If our conductor doesn’t think we were stellar, he never makes them available. I think the last time we passed muster was the Mozart Requiem.